Loss of homeland at the hands of a totalitarian regime is perhaps one of the most traumatic events a person can experience. An individual’s exilic trauma, when collectively experienced, becomes part of the national narrative and psyche, expressed through common culture and beliefs. The songs that begin this paper exemplify this: Estefan, Cuban-born, sings of her continued emotional identification with her ethnic homeland; Menuets tell from within Sovietoccupied Latvia of the experience of internal exile, asking their own people to join together in song to defy a system of oppression and fear; and 2001 Eurovision Song Contest winners Estonian Padar and Aruban Benton evoke the emotion of the Estonians’ precarious yet tenacious hold on identity throughout occupation that brought the people of the nation back “together again,” through the famous Singing Revolution. Song keeps the national memory alive and feeds the internally and externally exiled soul. This paper is not about songs, but it is about the trauma of exile and how the emotion it creates shapes the lives of not only those who lived through the experience but also of the generations that follow. I present the results of a pilot survey carried out on younger members of the Latvian and Estonian diaspora communities, on their motivations for coming to live in their respective Baltic homeland, and their experiences in having done so. Many have come to work, some to study, others still simply to spend time here. Hence, the need for this study: what underlying influence unites us in our desire to spend a part of our lives in a country so different and so far from where we grew up, albeit the ancestral homeland? The idea came about because I have often wondered about the driving force and purpose behind my own decision to spend time in the region. My mother’s mother was Latvian and her father Estonian. My grandmother left her home in Riga at the very young age of 17, her parents having been deported to Siberia. My grandfather left Tallinn, some five years older. They got together during their time in the Displaced Persons’ (DP) camps in Germany. My Baltic heritage has always fascinated me, and tellingly, when required to do an oral history research project in secondary school, I chose to interview my grandparents on their war-time, flight, refugee, and immigrant experiences, as well as my mother on her memories of, and feelings and attitudes towards, growing up as an immigrant child in Australia. I could, for example, quite easily have chosen to have researched into my Maori heritage, which would have been much easier at the time as we were living in New Zealand—I had to conduct the “interviewing” with my grandparents via written questionnaire. I am, so to speak, “part Maori” (as well as “part Irish” and “part Danish”) from my father’s side—my father being from New Zealand. But something drew me to my Baltic past more than anything else. I have always thought that it was the close relationship with my grandmother, and the—sometimes rather intensely emotional —discussions that we had together about Latvia and her experiences that embedded her ethnicity into my psyche. Precisely for this reason, when compiling the present survey I chose to include questions about how emotional the memories of the younger members of the diaspora were of the discussions they had had with those that had lived through the war and flight experience, as well as how close they had felt to these people and the diaspora community in general. In what follows, I begin by establishing the theoretical background for the concepts of national and ethnic identity and how these phenomena are affected by the trauma of exile, specifically in terms of the experiences of Latvians and Estonians. I move on to relate these experiences to those of the Cuban- Americans before then presenting the results of the survey. I conclude with a discussion of the implications of the results, including what lessons from the Baltic can be gleaned for any possible future return to the homeland for younger members of the Cuban exile community. It is of course, a moot point, how far this individuality is a purely subjective phenomenon, how far, that is, we are dealing with the sense of common ethnicity rather than any ‘objective’ ethnic reality. [Ethnies are] essentially social and cultural […] shared experiences […] handed onto the next generations who modify them, according to their own experiences and interactions (p. 22). I suspected, however, that many young Latvians and Estonians feel their ethnie is “in the blood.” To investigate this, the survey asked diaspora members if they felt their ethnicity was “in their genes,” as well queried their view on their (blood) “right” to citizenship of their Baltic homeland over Soviet-era immigrants. As we shall see, the general perception is that the right to citizenship definitely is in the blood. I would argue that these findings point not to the biological inheritance of ethnicity, but rather to the powerful intergenerational transmission of emotion. We imagine ourselves as members of a particular (ethnic) community (Anderson, 1991) through socialization and inherited (but learnt) memories; we were not born in the Baltic region but, by virtue of the strength of our association with it, have “returned” as representatives of our ethnies. I cannot conclusively state that this phenomenon applies to, say, adopted children of Baltic refugees—that they would also feel a strong association with a Baltic ethnic identity—but it seems that, given the necessary socialization, indeed they would. Studies have shown, for example, that Turkish immigrants in Germany have internalized societal guilt felt by the wider German community about the holocaust (E. Onken, personal communication, 2004). It doesn’t make sense to speak of oneself as ‘fullblood,’ ‘part-Aboriginal,’ ‘half-caste,’ or ‘quartercaste,’ etc… Identity is not about hierarchies. No one experience of being [Australian] ‘Aboriginal’ in this country is more real than or superior to another. It is racism that has taught us to think this way (p. 206). Cultural trauma occurs when members of a collectivity feel they have been subjected to a horrendous event that leaves indelible marks upon their group consciousness, marking their memories forever and changing their future identity in fundamental and irrevocable ways (p. 1). The trauma of social change involves “traumatogenic” (Sztompka, 2004, p. 159) events, including foreign conquest and revolution. For Latvians and Estonians, the Soviet occupation is undoubtedly the single most trauma-inducing event in recent history, although the collapse of communism for Soviet-era Russian-speakers in the Baltic states saw an entire reversal of the social hierarchy in which their reality, “the whole history of the USSR [was] rewritten, showing terror and extermination rather than a workers’ paradise” (Sztompka, 2004, p. 164). Kõresaar (2004a), in her analysis of Soviet life stories, contends that people’s own historical narratives reveal a clear split between ethnic Estonians’ and Russianspeakers’ understanding of history. Divided into four stages, the Estonian assessment follows the schema + – – + (first period of Estonian independence, postwar period, Soviet period, and renewed independence); for Russian-speakers it is the exact opposite, thus – + + – (Stalinist repressions at home, finding a new home and work, “mature socialism,” Estonian independence). Traumatic and traumatogenic social change—collectively shocking, sudden, comprehensive, and radical events that induce an “unbelieving mood” (Sztompka, 2004, p. 159)—become part of people’s collective national identity construct, in much the same way that glorious historical narratives do (Giesen, 2004). Because of their scope and intensity, traumatogenic events bring about a major rupture in one’s life history (Kõresaar, 2004b), infusing themselves in the national narrative and becoming the basis for the identity of the next generation. As Skultans (1998) states, “[w]hat is experienced as history by one generation becomes structure for the next […] [and] younger Latvians ‘remember’ the war at second remove through the memories and accounts of older people” (p. 103). Indeed, when participating in my earlier research, my grandmother made the enduring traumatogenic nature of the rupture she had experienced very clear: “I did not like [Australia] at all. Shall we be honest? After being here […] the first couple of years, I cried. I wanted to go back to Europe. In later years we met people who were more like us” (I. Sarapu, personal communication, 1992). Writing some 50 years after having left Latvia, she still reported the loss of and longing for a “normal life”: “I still think I would have liked to have [had] a safe life with my parents and been a normal person in normal times. I know that things that are still fresh in my mind are history to learn about for you—so learn your lesson well—no communism ever!” (I. Sarapu, personal communication, 1992). She is explicit about her wish to transmit the lessons of her loss to me, and, indeed, the world: “It has definitely been an experience and character builder that one could not buy with money. Towards communism—I still get goose pimples when I think about it. I hope the whole world has learned about the greatest evil on earth” (I. Sarapu, personal communication, 1992). As Kõresaar (2004b) maintains, in Estonia during the Soviet occupation “memories of [childhood] experience were crystallized and served as a patriotic antireality opposed to the dominant reality” (p. 330) during which time national symbols and images took central place in the historical memory. It is my contention that the very same process occurred abroad, perhaps even to a larger extent as Baltic émigrés were able to overtly proclaim their ethnic sentiments. Intensified by the trauma of exile, national themes became consolidated within the diaspora community and passed on to one or more subsequent generations. Muñoz (1995) similarly notes about the Cuban exilic identity—or cubanidad—that, “[a]nyone who is familiar with Cuban exile communities knows that Cubans live in memory […] a memory of the island” (p. 76). But to what extent is the case of cubanidad in the United States similar to the experience of Latvian and Estonian exiles there and elsewhere in the world? There are many myths surrounding the Cubans of the United States which would have us believe that they have little or nothing in common with Latvian and Estonian diaspora communities. Popularly portrayed as “exemplary immigrants” (Cotanda, 2006; Mirabal, 2003; Pedraza, 1995), Cuban-Americans are often perceived in the U.S. media in terms of the first-wave refugees, many of whom have come to constitute the so-called “Miami monolith” (Mirabal, 2003, p. 370). The problem with this perspective is, firstly, that it assumes a static view of culture. While I contend that the trauma of exile promotes the intergenerational transmission of certain ways of understanding the world and history, the all-or-nothing understanding of cubanidad—that continues to see Cuban-Americans as refugees rather than immigrants—does not allow for a more complex and nuanced understanding of individual identities which inevitably come about when refugees take up home in a new country. As Cotanda (2006) asserts, “deep down inside, I know I can never fully make sense of who I am. Mine will always be ‘an unidentified borderland,’ one full of porous categories, shifting meanings, multiple voices” (pp. 585–6). Certainly, Cuban exiles have had a greater opportunity to maintain a more insular community compared to Latvians and Estonian, given their greater numbers and higher concentrations, particularly in Miami. Latvians and Estonians, most of whom resettled in the U.S., Canada, and Australia, had little chance of being able to continue to identify with the category of refugee and refuse the category of immigrant; dispersed around the world, the diaspora groups had to integrate or assimilate. Fortunately many chose the former, thus continuing the transmission of their ethnie. A second issue is that the all-or-nothing notion of cubanidad is problematic for subsequent U.S.-born generations, who have little choice but to assume a hybrid identity given the assimilatory nature of societies such as that of the United States. They cannot exist as refugees. Thirdly, the social realities of the “manifold migrations” (Pedraza, 1995) from Cuba are obscured by the ‘Cuban success story’ much loved by the American media” (p. 323). The first wave of mostly middle class refugees—an obvious target of the communist regime—were also mostly white. These have been followed by blacks and members of lower socioeconomic echelons, and although they overwhelmingly continue to be political exiles (Pedraza, 1995), their existence is denied by the conceptualization of the U.S. Cuban community as white, successful, and having little to do with other immigrant groups. Clearly, those from lower socioeconomic ranks arrive in the United States with less human capital, such as level of education, as do many immigrants from other parts of Latin America. Indeed, it is through comparison with other Latin Americans that Cubans are seen as exemplary (Mirabal, 2003), something which, according to Casal, “desensitized them and others to the hidden costs of success, and it isolated them from other American minorities” (cited in Mirabal, 2003, p. 371). As González Pando (1997) and Pedraza (1995), among others, have argued, the refugee is distinct from the “regular” immigrant in terms of the push versus the pull: immigrants tend to be drawn by the promise of a better economic existence (the pull), whereas refugees are forced to leave their homeland, very often in fear of their lives (the push). Yet an understanding of Cuban-Americans as immigrants does not deny the trauma of their exile. 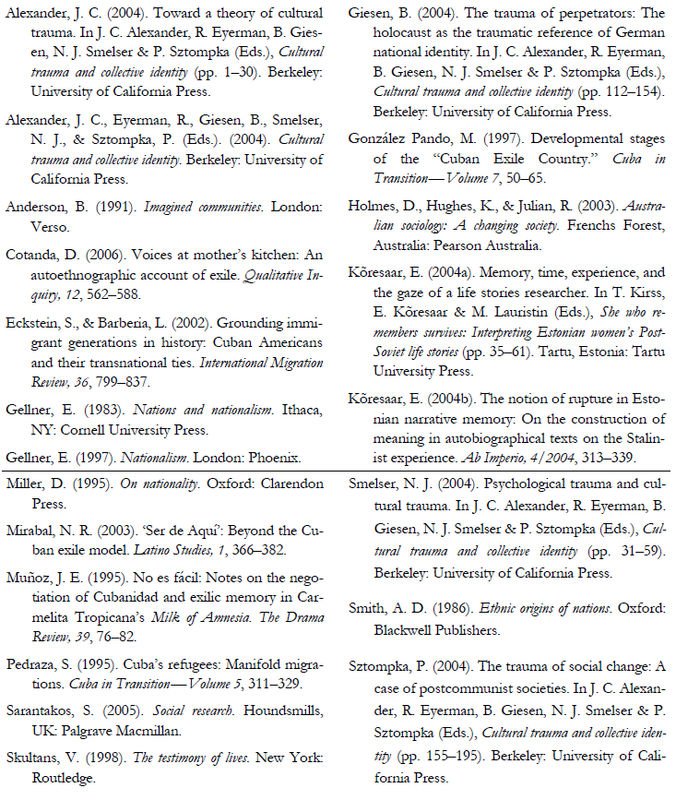 Although Cotanda (2006) denotes Cuban identity in the United States as “a shared perception that Cubans’ national experience is different from that of any other people” (p. 584), this paper is written precisely to explore the similarities of the experience of Cuban and Baltic exiles in their shared plight of fleeing communist tyranny. What is required is a multifaceted understanding of the notion of cubanidad in the United States and how it is likely to manifest itself. For example, Cuban- Americans are divided on the issue of visiting the island while it is still under communism, with many of the first wave in an unwavering boycott (Eckstein & Barberia, 2002). In the second generation, some concur with their parents, while others have defied them and visited Cuba. As Alejandra (as cited in Eckstein & Barberia, 2002) notes on her trip, “my sisters and mother are unhappy with me, as are my Miami relatives” (p. 823). Somewhat ironically, however, it is the non-Cuban-born generation that is most likely to be able to identify with the Cuba of today, irrevocably changed by the passage of time and the inefficiencies and repression of communism. Liliana (as cited in Eckstein & Barberia, 2002), one year old when she left Cuba, made a return visit: “I cried every night because it was the first time I felt at home. It was similar to when Jews go back to Israel and experience their roots [….] I experienced a sense of homecoming” (p. 822). She notes that her mother, on the other hand, “found it was not her home anymore […] the trip was not an emotional homecoming for her” (as cited in Eckstein & Barberia, 2002, p. 823). I, too, recall my Latvian grandmother writing to me from Riga on her first return in 1993, that she had cried on seeing the city: not so much out of joy but rather sorrow, the realization of what half a century of Soviet occupation had done. Indeed, it would seem that those with a sense of the homeland belonging to subsequent generations that have not lived in the pre-communist period that are more likely to accept the changed realities of the post-communist period. The collective memory of the Cuban exile experience is deeply influenced by a language rooted in the longing for returns as well as the imagining of those returns. So lasting are these emotions that for many born in the United States to Cuban exiles, Cuba and being Cuban has [sic] evolved into a memory that is handed down and imparted through pictures recollections, and a nostalgia that so often belongs to others (p. 367–8, emphasis is mine). Cotanda (2006) similarly asserts, “[a]s an exile, the pain I feel, although individual, is also a collective pain, one felt by many others” (p. 585). Yet what we must bear in mind is that, just as we have seen that “[n]o one experience of being [Australian] ‘Aboriginal’ […] is more real than or superior to another” (Holland as cited in Holmes et al., 2003, p. 206), no one experience of cubanidad, Estonianness, or Latvianness in the diaspora is more real than or superior to any other, regardless of home language, skin color, or pureness of blood. Our ethnicity is, after all, how we conceive of ourselves. The pilot survey was responded to by 11 Estonians (four females and seven males) and 16 Latvians (nine females and seven males). It was distributed by email using the so-called “snowball” (Sarantakos, 2005, p. 165) sampling technique, where participants known to me recommended and forwarded the survey on to others. The survey was made up of a total of 75 questions in English: one for each of the respondents’ parents’ ethnicity, one on the gender of the respondent, one on whether or not they held a Latvian or Estonian passport, with the remaining 71 making up the body of the questionnaire. In this last section, respondents were asked to indicate the extent to which they agreed with each of the 71 statements on a threepoint scale. During the analysis, these questions were grouped into nine categories (although they were not necessarily arranged as such in the actual survey): (1) strength of ethnic identity—external factors; (2) strength of ethnic identity—subjective evaluations; (3) emotional memory; (4) presence of unresolved blame in childhood; (5) present unresolved blame; (6) objective statements regarding the Soviet occupation; (7) anti-left sentiment—past and present; (8) changes in attitudes towards major historical events; and (9) present attitudes towards ethnic identity. The results of each category are summarized below; however, given the large number of questions, only certain results—those considered most representative of the findings of the study—are discussed. The question regarding passports was posed as it was felt to be an indicator of the strength of ethnic sentiment of the respondent and/or the diaspora family in general. From the Latvian sample, 75% of respondents reported holding a Latvian passport.5 The results were more telling for this group, as citizens of the First Republic and their descendents were required to apply for citizenship by 1995 in order to be able to retain their other citizenship(s). Estonian diaspora members, in order to remain in the country for an extended period, must apply for an Estonian passport, to which they are automatically entitled whilst remaining citizens of the diaspora nation. This explained the higher result for Estonia (91%). Even so, the indicator for Latvia was very high. The results of the parents’ ethnicity questions revealed a very strong incidence of being mostly or fully of their ethnic background. For Latvians, 81% of mothers and 94% of fathers were “full-blooded”; the results for Estonians were 82% and 73%, respectively. As I have previously asserted, however, this is in no way a foregone conclusion, and the results also indicated that 13% of Latvians and 18% of Estonians surveyed had at least one parent who was not of their Baltic ethnicity (Table 1). Only a small percentage in both diaspora groups had not learnt or spoken Latvian (13%) or Estonian (9%) at a young age or participated in cultural activities (13% and 18%, respectively), or had older relatives do so (6% and 9%, respectively). Perhaps more importantly for the transmission of identity, however, most respondents had spent time with older diaspora members (Latvians 94%; Estonians 91%). In the family home national symbols had been important for both groups, but more so for Estonians (91%; Latvians 81%). Estonians in particular attributed a strong feeling of belonging to the diaspora community and saw it as having been more important than their wider home nation—all respondents indicated so to at least some extent, as they did for the statement regarding the importance to them as a child of Estonian national symbols. The results for Latvia were less emphatic (88% and 87%, respectively), although Latvians had felt relatively closer to other Latvians as children (88%; Estonians 72%). This finding was supported anecdotally by the additional comments made by Estonian respondents that Latvians in the diaspora had always appeared to them to be more of a cohesive, tight-knit group. These questions were designed to identify specific themes in the intergenerational transmission of rupture and emotional memory. The Estonian findings appeared to indicate that the presence of emotional discussion in the childhood of respondents about Estonia and deported relatives and friends had not necessarily been central in the formation of their ethnic identity—in almost half of the responses (45%), it was indicated that life during the independence had not been discussed at all, nor had the experiences of deported friends and relatives (45%), although DP camps had been discussed in 63% of cases. Even more striking was the outcome of the Latvians: the independence period had been spoken about in just over half of cases (62%), yet exactly three-quarters stated that DP camps and deportations had not been discussed at all. Most Estonians (73%) had, however, cried as youths in relation to emotional issues regarding Estonia, although the majority (55%) did not anymore. Slightly less than half of Latvians reported crying in their childhood because of emotional memories or issues concerning Latvia (44%), and only one-quarter in their adulthood. Just over half in both communities (Latvia 63%; Estonia 54%) agreed that an injustice had occurred to them because of the Soviet occupation, a finding that does, nonetheless, suggest the presence of a reasonably strong intergenerationally transmitted emotional memory and sense of rupture. In all cases Latvians reported blame from their childhood towards “the Russians,” with Estonians doing so in the majority (91%). In all cases Estonians reported blame towards the “communists,” and Latvians in the majority (88%). Less evident was blame towards the “Soviets,” particularly amongst the Estonians (54%); although, as one respondent noted, there is no clear equivalent for “the Soviets” in the Estonian language (the Soviet period is, in fact, referred to in Estonian as vene aeg—or “the Russian time”). Clearly, animosity towards these groupings had existed, although this was unsurprising given the extraordinary circumstances the respondents’ families had been through. Without studying diaspora members who have not lived in the Baltic, it is impossible to show causation between this variable and the subsequent decision to move to Latvia/Estonia, however there certainly seemed to be a strong association, especially given present attitudes, discussed below. I now examine whether childhood blame has translated into the present. Similar strongly affirmative results were presented in both groups for whether or not the respondent felt “the Russian people” were to blame for the present standard of living (Latvians 75%; Estonians 81%) as well as the ending of the countries’ former western status (Latvians 100%; Estonians 82%): particularly in response to the second issue, with all Latvians agreeing to at least some extent, and 73% of Estonians strongly agreeing. The majority of both groups (Latvia 75%; Estonia 54%) felt they had more right to citizenship than Soviet- era immigrants, although Latvian respondents mostly only somewhat agreed (44%). Latvian responses indicated a greater dislike of the sound of the Russian language (69%; Estonians 45%). Latvians, however, revealed greater knowledge of Russian, with only 19% not having learnt or improved at all; the corresponding figure for Estonians was 45%. This correlated with homeland Estonians’ figures for proficiency in Russian, and could indicate less need for the language in Estonia and/or less visibility of it, rather than lack of desire—although 55% of Estonians stated that they were not indifferent to the language, suggesting they were not in favor of its use at all in Estonia. Another factor was almost certainly the greater linguistic distance between Estonian and Russian; while Latvian and Russian are both members of the Indo-European family of languages, Estonian, a Uralic language, is not. The result for having made Russian-speaking friends was therefore quite interesting in that Latvians had done so less (75%; Estonians 91%); in both groups the tendency for this question, however, was towards somewhat having done so (Latvians 44%; Estonians 64%). The majority in both groups (Latvians 69%; Estonians 54%) reported a more favorable perception of Russians in Russia than those in the Baltic. On more than one occasion the use of terms in the survey such as “the Russians” was questioned by respondents. One individual indicated agreement that Russians were to blame when asked but added “not all Russians.” Another simply questioned “who are ‘the Russians’?” While the aim of the study was clearly not to suggest that all Russians can be blamed for anything, it seemed, nonetheless, that cultural trauma can have tremendous effects on individuals which then manifest themselves through the application of blame to “responsible” groups. Such attitudes have been passed onto subsequent generations, as the above results revealed. One further look to the past and its influence on the present was the set of statements relating to anti-left political orientation. There was certainly evidence of substantial anti-left sentiment in the respondents’ pasts, especially amongst those relatives that had had memories of fleeing: exactly half of Latvians somewhat and half fully agreed that such relatives had been quite strongly anti-left; Estonians responded 18% and 73%, respectively. The trend was reflected again in their families in general (Latvians 88% and Estonians 82% in agreement) and the respondents’ feelings as youths (Latvians 69%; Estonians 82%). The majority of Latvians indicated they still feel nowadays at least somewhat anti-left (69%), although the majority of Estonians (55%) disagreed with this statement. This suggested, thus, that the memory of the DP experience has exerted an influence for at least some time on subsequent generations; and it is significant that these statements referred to issues not directly relating to ethnicity and national identity. To continue with the exercise of examining how past attitudes of the younger generation, shaped in the diaspora by the DP experience of elder members, have changed in more recent years, I now examine how certain attitudes towards history have changed since having lived in the Baltic. The responses regarding the change in attitude towards history unfortunately did not, due to the design of the survey, allow for indication of how the respondents’ views had changed. It seemed fairly safe to assume, nonetheless, that if, as was the general pattern, the belief in the diaspora community was shown to have been in strong agreement, and that respondents no longer fully agreed, then they had begun to question these “nationalist” historical narratives. The independence period was almost unanimously seen to have been a “golden age” when growing up, at least to some extent (Latvians 100%; Estonians 91%), although most reported now seeing this period in a more neutral light (Latvians 69%; Estonians 90%). Regarding the German occupation, unanimous support was reported for the perception in the diaspora of its lesser malevolence compared to the Russian occupations. The majority still partially or fully agreed with this notion (Latvians 69%; Estonians 73%). Interestingly however, regarding the view that participation in the German army was uncontroversial, while there was a more ambiguous—yet still strong—response regarding diaspora attitudes (Latvians 94% and Estonians 82% in agreement), these had changed surprisingly little, with 75% of Latvians and 82% of Estonians still agreeing. Regarding the notion that all Latvians and Estonians were against the Soviet system, both groups, again, showed quite strong belief in this when growing up (Latvians 94%; Estonians 82%), yet almost half (44%) of Latvians only somewhat agreed with this now as do 27% of Estonians; 44% and 45% still fully agreed, respectively. Estonian responses regarding designation in the diaspora of Soviet-era immigrants as “colonists” were more emphatic—100% agreeing at least to some extent with 82% fully—than those of Latvians (56% in full and 31% in partial agreement). Exactly half of the Latvian respondents, however, no longer held this view, whereas almost threequarters (72%) of the Estonian respondents still agreed. The general response regarding Soviet-era immigrants as corruptors of the level of civilization of the Baltic countries was one of affirmation from the diaspora (Latvians 94%; Estonians 82%), with continued belief in this amongst the younger generations (Latvians 82%, Estonians 72%), although mostly only somewhat so amongst Latvians (63%). The notion of immigrants’ own culpability for their lack of titular language skills showed a very similar trend to the previous statement (Latvians 94% and Estonians 91% in the diaspora community), although Estonians joined the Latvians in today believing in this idea mostly only somewhat (45% and 50% respectively). It seemed that attitudes towards the major historical events experienced by the elder members of the diaspora had changed the least amongst the younger generation, whereas those ideas that related to the Russian-speaking immigrants had changed the most, undoubtedly due the respondents’ experiences in having lived alongside these people and seeing that they, too, had in many ways been victims of the Soviet system. Finally, I examine respondents’ present attitudes towards their ethnicity in order to ascertain their relative strength and endurance. Both Latvians and Estonians indicated quite strongly that it means more to them to be Latvian/Estonian than the nationality of where they grew up (94% and 82%, respectively), although for Latvians having lived in the country it more partially (50%) than fully (38%), affected their feeling this way (27% and 64% for Estonians, respectively). Latvians had been more fully confident in their language skills when coming to the country (50%; Estonians 36%), but both groups indicated strong linguistic benefit from having lived there (Latvians 100%; Estonians 91%). The vast majority of both groups felt that their ethnicity is “in their genes” (Latvians 88%; Estonians 91%), although around one-third of each group only partially so (38% and 27% respectively). This possibly indicated the different reality faced when living with homeland Latvians and Estonians, compared to those of the diaspora, and the realization of the differences brought about by the culture of the country where they grew up and the socialization involved versus that of the Sovietized Baltic societies. Most respondents did not feel that they had been compelled to come to their ethnic homeland, generally disagreeing with all three statements to this effect: Latvians were most strongly against it being a “duty to correct history” (81%) and Estonians against not being “able to forgive” oneself for not doing so (73%), although the majority of both Latvians (57%) and Estonians (54%) were at least somewhat in agreement that there had never been a question of not living in Latvia/Estonia, and the majority of Estonians (63%) at least somewhat saw their living in Estonia as a “duty to correct history.” Latvians unanimously saw living in the country as “basically an interesting change,” as did the majority of Estonians (81%), but largely only partially (36%). Latvians considered the “return” of ethnic Latvians in general to be good for the country (88%), although their own contribution was mostly seen (44%) as only partially beneficial; Estonian respondents tended to see both their own (55%) and others’ (55%) “return” as making Estonia partially better off. There was unanimous support from both groups of respondents for the need to protect both the language and the culture of each country: a suggestive finding, given the hypothesis that strength of ethnic identity strongly motivates the desire to “return.” That is, regardless of the extent of ethnicity by blood, almost every individual valued the culture and language strongly (Latvians 94%; Estonians 91%), perhaps identifying one of the most important prerequisites for the motivation to live in Latvia/Estonia. Although the majority strongly agreed that they were worried about the “Latvianness” (69%) or “Estonianness” (64%) of the countries due to the changes in ethnic composition during the Soviet period, the result was somewhat mixed, with 19% of Latvians and over one-quarter (27%) of Estonians disagreeing with the statement. This could be taken to mean either that they had come to terms with (or had always accepted) the changed ethnic makeup of the countries, or that they felt that Estonia and Latvia were controlling the situation well enough to protect their languages and cultures. All respondents believed they had the right to automatic citizenship, the majority strongly so (Latvians 94%; Estonians 73%). Given that respondents had lived—or did live at the time—in these countries almost certainly because of their ethnic background, this was an understandable position and a justifiable response. Compared to the answers relating to their growing up (see above), respondents reported a relative decrease in the significance of national symbols, but in both instances Estonians showed a higher tendency to value such symbols vis-à-vis Latvians. As to whether they felt more nationalistic than homeland compatriots, most Latvians agreed either to some extent (44%) or fully (50%) with this notion, and while over half of Estonians (64%) fully agreed, more than one-quarter (27%) did not. And finally, although most agreed from both groups (Latvians 69%; Estonians 91%) that they did not enjoy a standard of living as high as in their home country, the majority in both cases (75% and 100% respectively) reported that they would be happy to live indefinitely in Latvia/ Estonia: a strong indication that—for them —ethnicity and their ancestral home were of great significance. This pilot study provides a general impression of the perceptions of two diaspora groups. Its aim was to determine why they had decided to come and live in the country where their parents or grandparents were born, far from where they grew up. It was of great interest for me to survey others who were also not “full-blooded” Latvian or Estonian, and/or did not speak the language at home. Not, as I have asserted, that such things matter for “Latvianness” or “Estonianness,” but rather the opposite: to support my hypothesis that they do not matter. What seems to be clear, albeit from the limited scope of this survey, is that notions of history passed down the generations are enduring, especially if they are tinged with sadness and emotion. People of both groups indicate little change in the national version of history they had learnt at home. Most respondents report crying because of issues relating to their ethnic homelands; the majority feel to some extent that a personal injustice has occurred to them because of the Soviet occupation. These are strong sentiments, evidenced by the fact that these people have actually come to live in the Baltic countries and overwhelmingly intend to continue doing so, despite a general indication that their standard of living is lower. Are these emotional, national issues the reason they came? Certainly not in every case; but, as I have argued, in very many instances the weight of the loss of homeland and its culture and language as memory for one generation, become reality for the next. There are clear lessons from the Baltic for Cuba in this study. A whole generation of young foreignborn Cubans are coming of an age to be able to participate in a transition on the island. And while a successful transition requires the commitment of locals who have lived through communism, the diaspora constitutes—as it did in the Baltic cases—an invaluable source of cultural, social, political, and economic resources. A Cuba in transition needs the participation of those with a sense of cubanidad from abroad. And cubanidad exists in those who feel Cuban—regardless of blood, language, or race. These are the people who have Cuba in their heart and can also make it their home. 2. At times I don’t understand why I miss you so much, that despite the years, I still love you. Share your sorrows, I’m crying with you. I can’t forget; you’re a part of me. 3. Sing of green fields, sing of a ray of light, and weave it into a cheap joke. Your own people will understand that a song is a cry. 4. This is actually a statement about the view of history in Estonia itself at the end of the communist period, but the notion is of clear relevance in the diaspora as well. 5. All figures reported have been calculated to the nearest whole percent. For this reason the sum of responses does not always equal 100%.